This 3-ingredient Chicken Slaw with Pomegranate is a salad that gives you crunchy, healthy and filling satisfaction. If you like crisp and cool coleslaw, you’ll love this quick and easy salad that includes chicken as your protein and a sweet, tangy surprise with pomegranate seeds. The Glory Kitchen Mexican flavors of San Miguel nut & spice mix add a little bit of smoky chili spice as well as additional crunch from the chopped pumpkin seeds in the nut blend. I love the combination of the crisp cabbage with sweet and juicy pomegranate seeds. If you really want to throw this tasty meal together in no time at all, you can buy a pre-cooked rotisserie chicken, a pre-shredded bag of cabbage, and a pomegranate which has already been seeded – talk about a quick meal! The dressing is made up of ingredients most likely sitting in your refrigerator right now. I hope you’ll give this delicious and crunchy salad a try – it was a great meal made in a matter of minutes. I think this salad would be equally delicious using the Provence, Mumbai, Cairo, or Penang nut mixes. A little extra flavor and crunch is always a good thing. 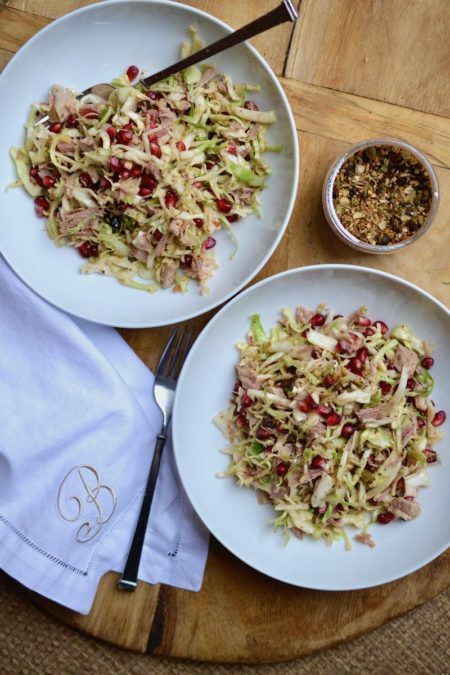 In a very large bowl, toss together the cabbage slaw, the cooked chicken and the pomegranate. Add the dressing and toss well to incorporate. Taste and season to your preference. Serve soon after it is incorporated to keep the slaw crunchy. I used shredded turkey since I had some in my freezer leftover from the holidays, however, I specified chicken in this recipe because it's so easy to purchase a store-bought rotisserie chicken, shred it into small pieces and throw it into your salad. Obviously, either turkey or chicken works beautifully.